I hope my fellow Americans enjoyed a blessed Thanksgiving weekend and that those outside of the States also had a wonderful weekend. I'm finding it hard to believe (and very stressful!) that the Holidays are upon us! 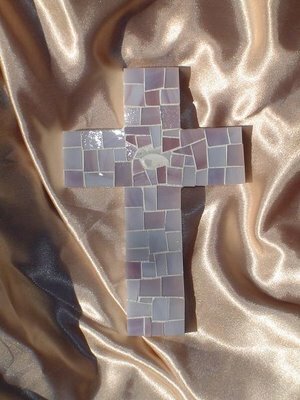 I finished this smalti mosaic cross plaque last night and wanted to share it with you. It was commissioned as a Christmas gift for my client's inlaws. It is composed of smalti (see below) with 10 bronze daisies tucked into the background for added interest. The finished piece measures approximately 4" x 4". Smalti (the plural of smalto) are specilised mosaic tesserae made from richly coloured glass. Originally developed for Byzantine mosaics, the glass contains metal oxides which produce an almost infinite range of colour possibilities. The molten glass is poured into flat slabs which are then broken into individual smalti with rough, irregular surfaces that may be pitted with air bubbles. Quoted from The Joy of Shards website. 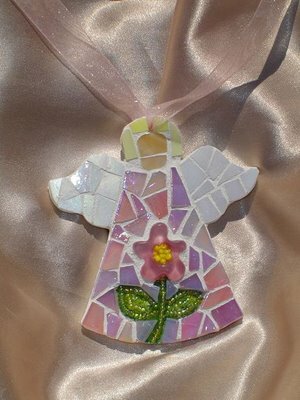 Smalti is more difficult to work with because it is much thicker than stained glass and therefore, much more difficult to cut. It also tends to have a mind of its own . . . meaning, it doesn't always want to break where I want it to! But the distinct "look" and "feel" it adds to mosaic artwork is amazing. Smalti adds depth and texture . . . and light dances off the pieces (you can see this at the top of the plaque in the pic above) giving very rich and true colors. The result is artwork with an Old World "feel" and a rustic charm. As you can see in the picture above, artwork made with smalti typically is left ungrouted. When I create a stained glass piece, my goal is to create uniform gaps (called interstices) between the glass pieces so the grout "rivers" are consistent and uniform. When I create a smalti piece, my goal is to fit the pieces as close together ~ even touching ~ as possible. If you are interested in learning more about smalti, here are the two websites from which I order my materials. The first specializes in Italian smalti and the second specializes in Mexican smalti ~ mosaicsmalti.com and smalti.com. One of the things I love most about the medium of mosaics is the wide range of materials that can be used in the artwork. The possibilities are endless and I really enjoy experimenting with and learning about new materials . . . and then combining them to add new depth, texture, color, tone, etc. to my artwork. It keeps my artwork constantly evolving. Off to create more artwork. Have a fabulous week! Wishing you and your family/friends a beautiful and blessed Thanksgiving holiday. Be safe. 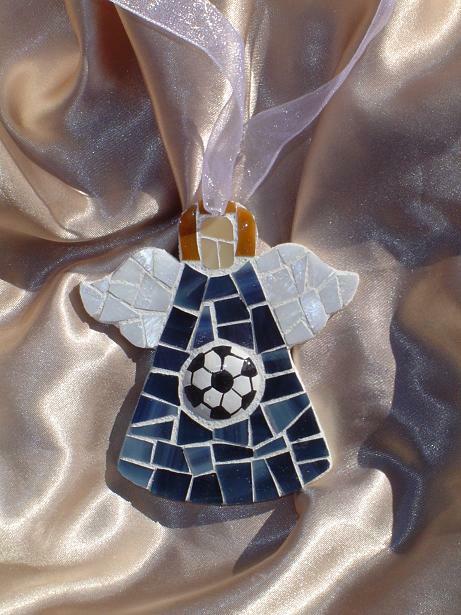 I have always been so blessed to receive tons of Christmas orders and this year is no exception. I am BUSY, busy, BUSY . . . and did I say busy?! WOW! 1. If you are thinking of giving a mosaic cross, picture frame, etc. as a Christmas gift, please contact me immediately and I'll see what I can do. I am very sorry but I can not accept anymore orders for large crosses or detailed artwork. Email me at marymakingdesigns@verizon.net RIGHT NOW!!! 2. 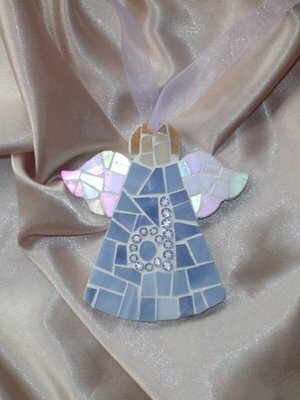 I can still take a few additional orders for Mosaic Angel Ornaments. They really do make a sweet gift or gift topper for pretty much every person on your list. It's a gift that can be enjoyed for years to come. Visit the Christmas 2006 page of my website for more info. 4. Can't figure out what to give somebody? 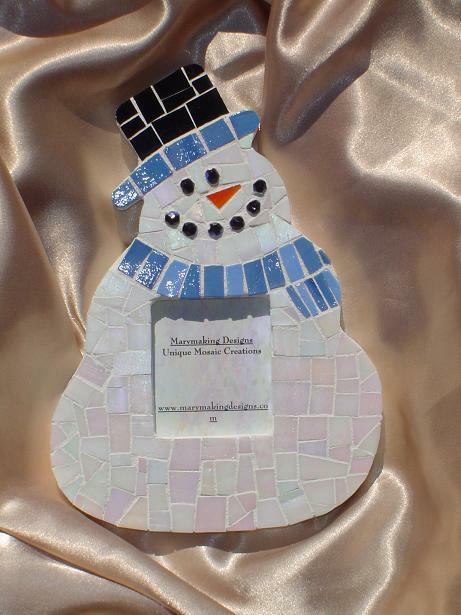 Give them a Marymaking Designs' Gift Certificate and let them choose what they would like. 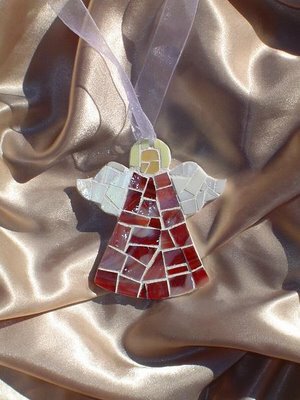 Visit the Christmas 2006 page of my website for more info. 5. 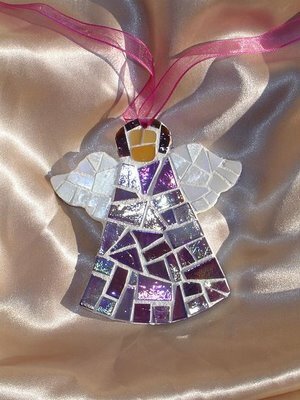 I also have a good selection of artwork (mosaic crosses, angel ornaments, etc.) that is ready to ship immediately. Visit the Available Artwork page of my website for more info. Thank you so much for your support and understanding! Wishing you and your family a blessed Holiday Season. P.S. If this is your first visit to my blog, please be sure to read through the previous entries and see pictures of my latest artwork! 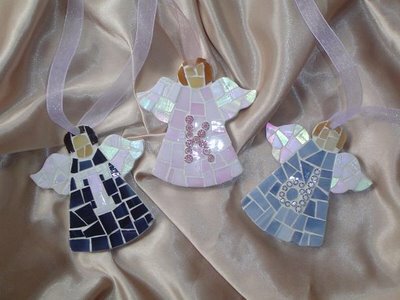 A Few More Angel Ornaments & the Snowman Frame Again! I love my Beaded Daisy Mosaic Crosses so much, I thought I'd try the idea on an angel! I snuck this picture into one of my previous entries but wanted to share the "official" picture. Isn't he adorable?!!! I'm getting ready to make him with a red scarf and hat band. I'll share a pic when I'm finished. I had a very productive day yesterday and finished 2 crosses, 3 angels and a picture frame. Go me! The second mosaic cross is a dove design on my smallest (4" x 6") cross base. 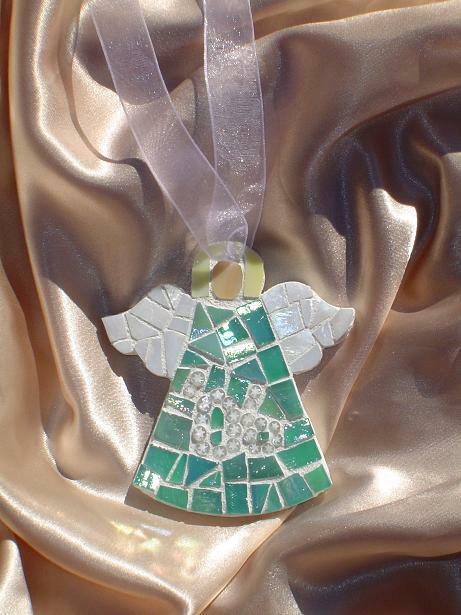 My dove designs are very popular in the larger cross sizes. However ~ this is my first time to use the dove theme on one of my smallest crosses. 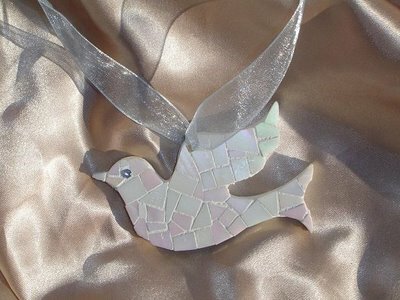 I chose a gorgeous Mother of Pearl dove "charm" to use as the focal piece. 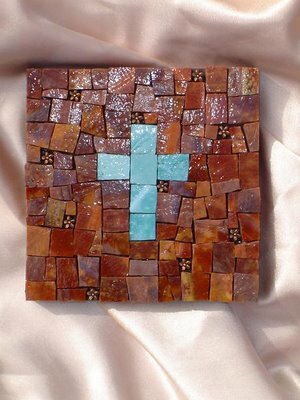 The mosaic cross was commissioned by my client as a Christmas gift for her grandparents. 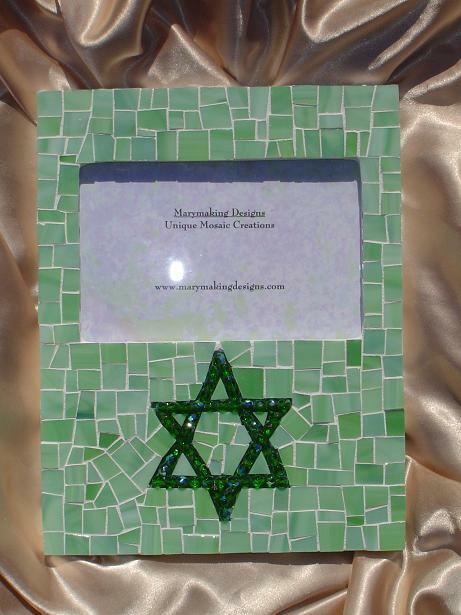 The mosaic picture frame was commissioned by my client as an anniversary gift for her parents. She is going to place a special picture inside the frame. Great idea! 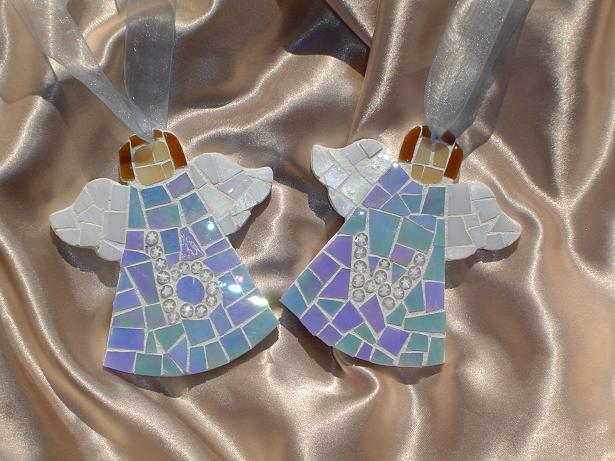 I shared a few of my Mosaic Angel Ornaments in my last post and wanted to share a few more. I love to create my angel ornaments because they seem to "come to life" and take on their own personality. Each angel is designed to resemble the recipient. 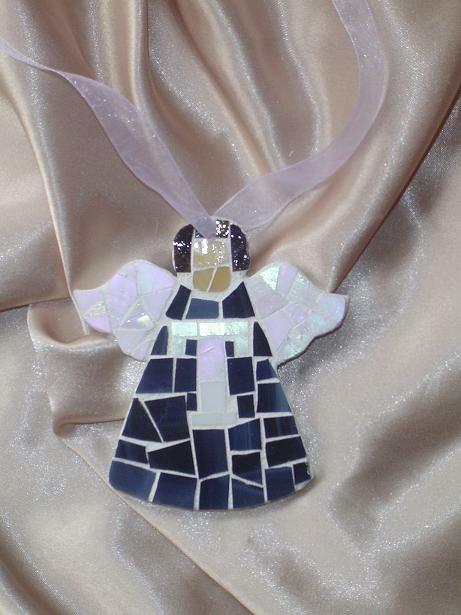 I customize each angel's hair, robe and design to my client's specifications. 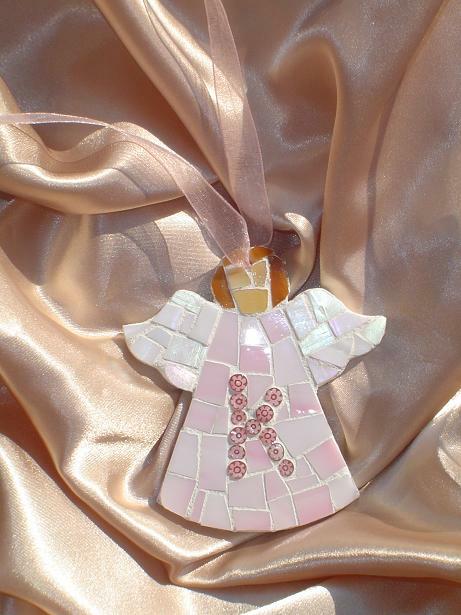 And ~ obviously ~ on the personalized angels, I include the recipient's initial. The Mosaic Angel Ornaments are perfect gifts for children, nieces, nephews, teachers, secret pals, angel lovers . . . pretty much anybody! To find out more information, visit The Christmas Page on my website. I wanted to share a few pieces that I finished today. As you can tell, I'm in full out Holiday mode! 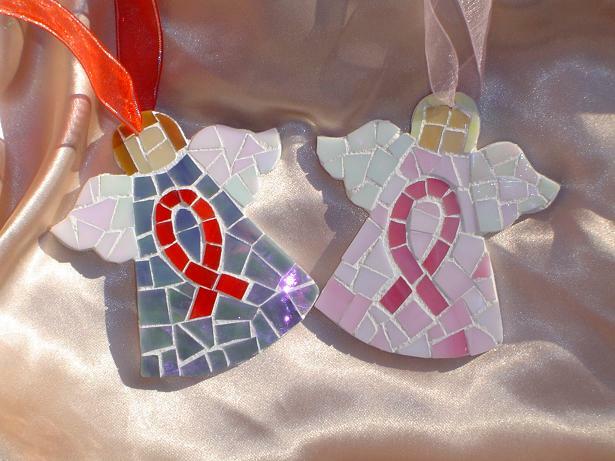 Charity Angel Ornaments ~ AIDS Awareness & Breast Cancer Awareness. The proceeds from the sale of these angels and other items in my Mosaic Charity Artwork Collection (click thru to see more about the Collection) are donated to the applicable charities. 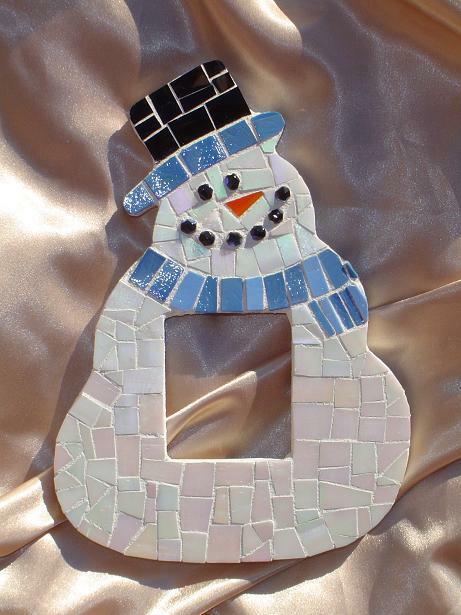 And a super adorable Mosaic Snowman Picture Frame. He's so cute . . . I'm going to make one for myself!!! Just a quick post to share some fabulous news: my first art show is officially booked. 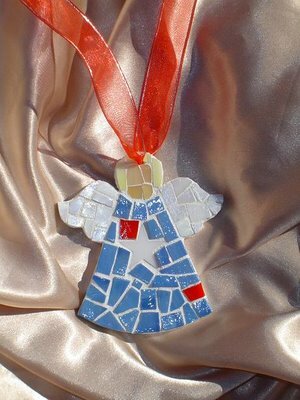 It will be in the Rotunda Gallery at St. Luke's United Methodist Church in Houston during the month of April . . . 2008. 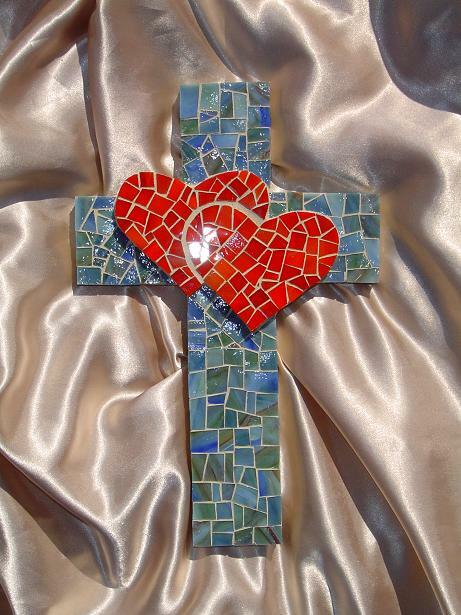 You can read more about St. Luke's Fine Arts' Ministry here. It's actually a very good thing that it's so far in the future. I can take my time deciding on the theme and creating the artwork, while still focusing on my business and my clients. Stay tuned for more info as I plan to share this journey on my blog! And if you know of other churches who offer Fine Arts Ministries or galleries that specialize in Christian art, please let me know. I was driving on the highway yesterday with my 3 sleeping children in the back seat. It was a beautiful sunny day with white, fluffy clouds in the sky. We were almost home and I happened to look up in the sky. I first noticed a huge cloud covering the entire sun . . . the cloud was backlit and appeared to be glowing . . . sun rays were pouring out from the sides. It was gorgeous. Then I noticed something amazing to the right of the cloud. A circular rainbow. It was a circle of light composed of all of the colors of the rainbow. I've never seen anything like it. It was awestriking and absolutely captivating(I'm surprised I didn't wreck the car while looking at it). My thoughts went immediately to the Noahic Covenant and what the rainbow symbolizes. What a wonderful feeling! I'm often asked what inspires me. My answer is simple: everything. God is the ultimate artist and when I open my eyes to the amazing (and even seemingly ordinary) things all around me, there is more than enough inspiration to spark my imagination and provide fuel for my arwork.